More Jack Petchey Winners at St. Charles in 2018! Dilys was nominated by the College’s careers advisor, her performing arts teacher/tutor and her peers for the Jack Petchey award. Dilys was a fantastic ambassador for the College during the recent Two Year Choices Day where she welcomed and guided speakers to their respective rooms for their talks in the earlier part of the day and later escorted various exhibitors and helped them set up for the very successful Higher Education Fair in the sports hall. Dilys’ professional and helpful approach was commended by visitors who cited her warm welcome and friendly support on the day. In addition Dilys has willingly helped Tim Shehu, College’s Career Advisor with setting up and organising university and higher education prospectuses in the College’s careers library, benefiting many college students. Dilys has also been described as thoroughly helpful in her performing arts group and someone who is always up for a challenge. She is a very talented young woman who is making excellent progress on her course of which she is fully committed to. 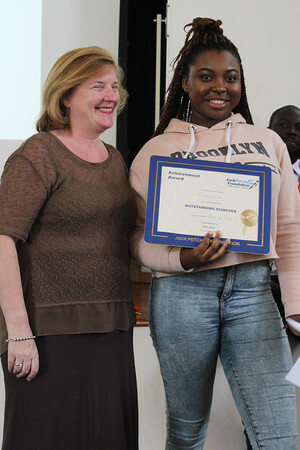 An example of this dedication and commitment was evident at the Jack Petchey’s annual award ceremony for her peers at Kensington Town Hall in January 2018 where she gave a beautiful rendition of “Ave Maria”, to the delight and applause of the audience. She also gave excellent performances at the College’s annual Christmas Cabaret production. Dilys is a well-respected member of her tutor group where she contributes effectively and is making the most of her opportunities at St Charles. She is destined for a bright and productive future and we look forward to her returning as one of our alumni to tell us all about it! Dilys has given £200 of her award money to the College’s Careers Department who have purchased some valuable resources which will support a wide range of SCC’s students in their career aspirations applying either to university or employment. The remainder of her money she used to fund refreshments for an end of term lunch party (May 2018) for her Performing Arts group and peers which was a fitting end to their successful year. Dilys stated “she felt very honoured to have received the award and has enjoyed getting involved in college life”. She has grown in confidence she feels through all her experiences during her time at St. Charles. We wish her every success. 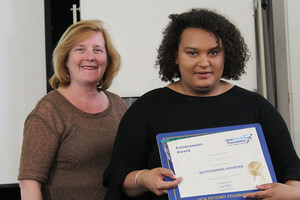 Kiaya was nominated for the Jack Petchey award by her tutor, health and social care teachers and Catherine Coyne from the College’s Learning Support Department. Kiaya boasts an excellent attendance record and is a thoroughly committed student on her Level 3 Heath & Social Care Course. She is excelling on this course and is well suited to it. It is fitting that she has been offered a place at Kings College next year, her first choice university to study nursing. Kiaya goes out of her way to extend her learning in her health and social care and sociology studies and to cite Ms Coyne; “she shows a maturity beyond her years in her approach to her studies and college activities.” An example of this mature and responsible approach is her mentoring of L2 health and social care students in her free time, proving herself to be an excellent role model with her exemplary manners and willingness to support others. She is described as thoughtful and kind to her peers and helpful and reliable in her dealings with staff. Outside her studies she is reported by her tutor (AAB) to be a model tutee and a fantastic tutor group rep who has helped with a whole host of tutorial activities including induction activities preparing and taking the lead on tutor groups tasks and representation in the whole college’s divisional liturgies and fundraising. Kiaya also represents the student population admirably on the College’s Equality & Diversity Committee and Anne-Marie Cahill, the Assistant Principal in charge of the committee states, Kiaya consistently brings thoughtful insights to the agenda items being considered. An extension of this was her involvement in whole-college assemblies on voting rights for women and she contributed enthusiastically to an International Women’s Day event organised in March by the College’s Learning Support Student Voice & Activity Group. Outside college Kiaya is also involved in volunteering activities. An excellent all round student, her contributions to college life and beyond have been fabulous and it is her helpful, pragmatic and humble approach that makes her stand out. Kiaya decided to split her award money between the Health & Social Care Department and the Learning Support Department at College. Kiaya was pleasantly surprised to be given the award she said. She is delighted and commented that she has been pleased to have been part of and contributed to a wide range of activities and events during her time at the College. We wish her well with her future nursing studies and look forward to her becoming part of St. Charles Alumni! Robert was nominated for a Jack Petchey award by the College’s pastoral team, his history teacher Mr Riley and Mr Wilson and Miss McHugh for his contributions to the College and wider community. Robert is in the first year of his A Levels at St. Charles. Robert is making excellent academic progress and is well on track this year on his linear programme according to his teachers. Robert is an extremely reflective and inquisitive young man who is keen to succeed. Apart from his studies, he is making the most of the opportunities that come his way in sixth form. He was elected to represent his peers on the College’s Student Council where he is reported to be doing a great job! Robert also used his initiative to set up a student run debating society in College which grew in popularity due to his enthusiasm and commitment. Enthralling debates on a wide range of topics took place in lunchtimes, adding greatly to the College’s enrichment programme for students. Robert also represented the College admirably on a Lessons from Auschwitz Project organised by the Holocaust Educational Trust and the College. You can read his recollections of the trip on our website. Robert, with Raffay Khalid who also attended the trip to Poland, is now organising a NEXT STEPS event to cascade the lessons learnt to the wider college community. Robert has proven himself to be a very reliable and dependable young man who maintains a good balance between his curricular and extra-curricular activities. Robert has opted to spend his £200 of his award money on a newly designed set of college T- shirts for the College’s team of Student helpers who willingly give up their free time to act as guides on open events and interview and induction events. The helpers include college council members and the T-shirts were designed by students. Building on his visit to Auschwitz, he also spent £50 to a trip to the Holocaust Education Trust’s annual conference in Westminster in July for a group of student ambassadors where a number of notable speakers will share their experiences of the holocaust, an event which will prove educational and insightful and the information will be cascaded to other college students on their return in their A2 History sessions and as part of his NEXT STEPS PROJECT, as above. Robert stated on winning the award that; “I felt honoured to have been given the award because I believe it to be a very prestigious award”. There is no doubt that Robert is well deserving of the honour bestowed upon him and we are confident he will continue to make a valuable contribution to the College community.